What with Lent being so late in coming this year, Shrove Tuesday’s pancake supper was not even two weeks ago, and so there is a good chance that many of you won’t be as excited as you typically are for Waffle Day; be that as it may, here it is. Våffeldagen is the Swedish for Waffle Day, and it is out of a bit of linguistic misunderstanding that makes today, the 25th of March, a traditional day of waffle eating. The more reverent aspect of the day is the Feast of the Annunciation. It marks the day that the archangel Gabriel visited Mary to deliver the news that she was to bear a child, a son, and that that child would be the light of the world, the son of God. It is March 25th and we are precisely nine months to the nativity. In many places, the day is also known as Lady Day, and this is where the waffles come in. In Sweden, the day is called Vårfrudagen, which basically translates to “Our Lady Day.” But Vårfrudagen, in some Swedish dialects, is awfully close in both spelling and pronunciation to Våffeldagen, which translates to “Waffle Day.” Swedes, as a result of this misunderstanding, have for centuries been eating waffles on Lady Day. It’s a tradition that has spilled over to wherever Swedes have left their mark, this annual excuse to eat waffles at any time of day on Vårfrudagen––breakfast, lunch, or dinner. And so we invite you to join them. We plan on doing so. The waffles in Sweden today are typically served with whipped cream and lingonberries or cloudberries. Enjoy yours as you wish! Image: “Het Vertrouwelijk Onderhoud” by Adriaen van Ostade. 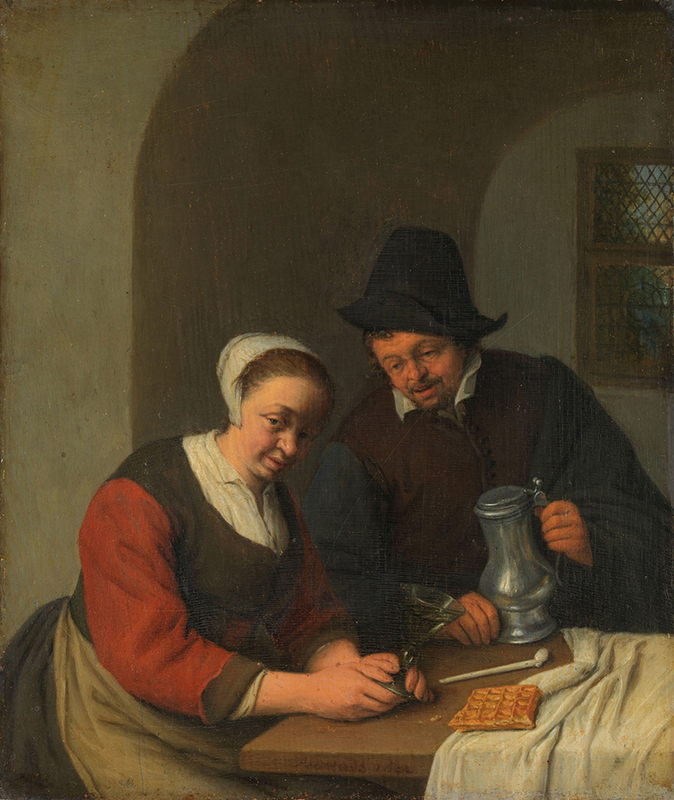 Oil on panel, 1672 [Public Domain via Wikimedia Commons]. These folks are about to enjoy a waffle together!